Pink & White Micro Mallows in 1Kg Bulk Pack. Absolutely ideal for use as a topping in desserts and shakes. Pink & White Micro Mallow These delicious, fluffy mini marshmallows are absolutely ideal for use as a topping in desserts and shakes. Rest assured that you are eating Halal. 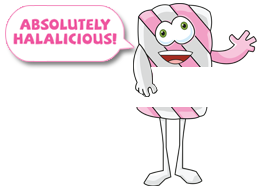 Heavenly Delights' marshmallows are the only HMC certified marshmallows available anywhere!